What SEO-friendly CMS plaform do we like the best? Find out here. Do you have any recommendations for an SEO-friendly content management system (CMS) platform? 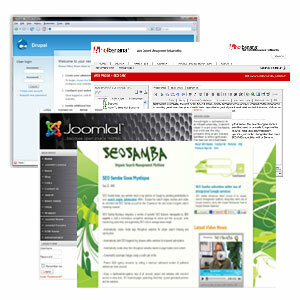 Specifically, can you provide any feedback/thoughts on SEO Samba as an SEO CMS platform? I see they are the only CMS listed as a resource at SEMPO. Answer: We are familiar with SEO Samba, and we know that it is promoted HEAVILY at the various AD Tech and SES Strategies sessions; it's no surprise it's listed as a resource at SEMPO. The software is SEO-friendly by allowing users the ability to construct pages with an eye toward how URLs, titles and descriptions can impact Google rankings. SEO Samba also makes it easy to build Google PageRank compliant 301 redirection pages and custom 404 pages as needed. It's definitely a quality CMS and one that you may want to consider. You may also want to consider Joomla. Joomla has many optimization features and can be SEO customized to fit your needs. But if you are looking for a SearchEngineNews.com recommendation, we love Drupal. Not only is it FREE (always a good thing) but it is probably hands-down the best open-source content management system available anywhere. It's very SEO-friendly and highly customizable. It even provides an SEO checklist on its site to allow users to get the most SEO benefit possible out of the software. Drupal just released version 6 in February, receiving very good reviews.